Protocols to generate hPSC mutant lines using the iCRISPR platform and to differentiate hPSCs into glucose-responsive β-like cells are described. Combining genome editing technology with hPSC-directed differentiation provides a powerful platform for the systematic analysis of the role of lineage determinants in human development and disease progression. Shi, Z. D., Soh, C. L., Zhu, Z., Huangfu, D. Genome Editing and Directed Differentiation of hPSCs for Interrogating Lineage Determinants in Human Pancreatic Development. J. Vis. Exp. (121), e55267, doi:10.3791/55267 (2017). Interrogating gene function in self-renewing or differentiating human pluripotent stem cells (hPSCs) offers a valuable platform towards understanding human development and dissecting disease mechanisms in a dish. To capitalize on this potential application requires efficient genome-editing tools to generate hPSC mutants in disease-associated genes, as well as in vitro hPSC differentiation protocols to produce disease-relevant cell types that closely recapitulate their in vivo counterparts. An efficient genome-editing platform for hPSCs named iCRISPR has been developed through the TALEN-mediated targeting of a Cas9 expression cassette in the AAVS1 locus. Here, the protocols for the generation of inducible Cas9 hPSC lines using cells cultured in a chemically defined medium and a feeder-free condition are described. Detailed procedures for using the iCRISPR system for gene knockout or precise genetic alterations in hPSCs, either through non-homologous end joining (NHEJ) or via precise nucleotide alterations using a homology-directed repair (HDR) template, respectively, are included. These technical procedures include descriptions of the design, production, and transfection of CRISPR guide RNAs (gRNAs); the measurement of the CRISPR mutation rate by T7E1 or RFLP assays; and the establishment and validation of clonal mutant lines. Finally, we chronicle procedures for hPSC differentiation into glucose-responsive pancreatic β-like cells by mimicking in vivo pancreatic embryonic development. Combining iCRISPR technology with directed hPSC differentiation enables the systematic examination of gene function to further our understanding of pancreatic development and diabetes disease mechanisms. Human pluripotent stem cells (hPSCs) have the ability to both self-renew and give rise to all derivatives of the three embryonic germ lineages. They provide a valuable resource for cell replacement therapy and disease modeling by serving as a unique platform to recapitulate cellular processes in a human developmental context. They are also a source of experimental cells for scalable, high-throughput analyses. However, progress has been limited because of two main challenges: the lack of efficient genetic modification tools and the difficulty in recapitulating the complex embryonic developmental steps in a culture dish. Genetic modification is an indispensable tool to study gene function in normal development and disease. However, while classical gene targeting approaches via homologous recombination have proven to be a powerful tool to dissect gene function in mouse embryonic stem cells (mESCs)1, this approach has been extremely inefficient when applied to hPSCs2,3. The recent brisk accession of programmable, site-specific nucleases from nature to laboratory use, including zinc finger nucleases (ZFNs), transcription activator-like effector nucleases (TALENs), and the clustered regularly interspaced short palindromic repeats (CRISPR)/CRISPR-associated (Cas) systems4, means that genome engineering has become a much easier task in a wide range of organisms and cell lines, including in hPSCs. These gene editing tools take advantage of the fact that chimeric nucleases such as the Cas9 endonuclease can permit a whole range of genetic modifications by inducing double-stranded breaks (DSBs) at precise locations, triggering the endogenous DNA repair machinery to activate either non-homologous end joining (NHEJ) or homology-directed repair (HDR). Both mechanisms may be exploited for genetic manipulation by inducing either random insertion and deletion mutations (indels; via NHEJ), to create frameshift mutations that nullify gene alleles, or precise nucleotide substitutions (via HDR), to recapitulate patient mutations for human disease modeling or to correct a disease-causing mutation for gene therapy. CRISPR/Cas-mediated genome engineering requires two components: the constant RNA-guided Cas9 endonuclease necessary for DNA cleavage and a variable CRISPR RNA (crRNA) and trans-activating (tracrRNA) duplex that specifies DNA target recognition. The crRNA/tracrRNA duplex can be replaced with a single chimeric guide RNA (gRNA), which have been found to work more efficiently5,6,7. While the CRISPR/Cas9 system has been adapted to most experimental organisms and cell lines, the delivery and expression of Cas9 and gRNA varies significantly and needs to be further optimized to achieve efficient genome editing in many systems, including hPSCs8. An efficient genome-editing platform, iCRISPR, has been established in hPSCs5. In this system, a TALEN-mediated approach has been used to target both alleles of the "transgene safe harbor locus" AAVS1 in trans, one allele with a reverse tetracycline-controlled transactivator (M2rtTA) and the other with a tetracycline response element (TRE) driving the expression of Cas9 (iCas9) in the hPSCs. In established clonal lines (iCas9 hPSCs), Cas9 is highly expressed with doxycycline treatment. Meanwhile, due to its small size (100 nt), single or multiple gRNAs can be easily delivered into iCas9 hPSCs with high efficiency and can direct Cas9 for site-specific cleavage, enabling efficient NHEJ-mediated gene disruption, as well as HDR-mediated precise nucleotide modifications in the presence of short single-stranded DNA (ssDNA) donor templates. The iCRISPR system can be used to successfully generate a panel of disease-mimicking hPSC lines with biallelic (homozygous or compound heterozygous) or heterozygous loss-of-function mutations in important developmental genes5,9. While a number of groups have reported efficient gene editing using CRISPR/Cas in hPSCs, the success remains limited to a small number of technologically adept laboratories. The iCRISPR platform offers an efficient yet simple solution for routine gene editing by researchers of different skill levels, and it has already been used in a number of published studies by our group and others9,10,11,12. This approach has also been further extended to inducible silencing based on the expression of dCas9-KRAB13. Along with the progress in genome-editing technology, significant improvements have also been achieved in hPSC maintenance and directed differentiation. Culture conditions for hPSCs have evolved from irradiated mouse embryonic fibroblast (iMEF) feeder-dependent to feeder-free conditions on defined extracellular matrix components, and from complex media formulations to chemically defined medium conditions14. Such improvements have reduced the variability in hPSCs due to batch-to-batch differences in iMEF preparation and knockout serum replacement components, and thus provide a more reproducible environment for hPSC differentiation. Meanwhile, improved knowledge of signaling pathways governing human embryonic development, as well as discoveries from high-throughput drug screenings, have led to improved differentiation protocols15,16,17,18. These protocols more closely mimic in vivo developmental steps and generate cell types that closely recapitulate their in vivo counterparts. For hPSC differentiation into the pancreatic lineage, initial protocols mimicked early pancreatic development relatively well but eventually generated polyhormonal β cells that were of immature fetal phenotypes and responded poorly to glucose stimulation. Recent advancements16,17,19,20 have allowed for the generation of glucose-responsive pancreatic β-like cells, which will enable us to investigate later events, such as the formation and the further maturation of monohormonal β cells. Here, we detail the application of genome-modified lines for the study of pancreatic development by combining the iCRISPR system with the hPSC-based in vitro differentiation platform towards glucose-responsive pancreatic β-like cells. This coupling of powerful genome editing tools with an improved hPSC differentiation protocol not only offers the speed and scale necessary to meet the growing demand for validating disease causality, but also enables sophisticated genetic manipulations for further mechanistic investigations into transcriptional control underlying normal development and disease9. This protocol is based on our work with hPSC lines H1, HUES8, and MEL-1 in the chemically defined and feeder-free condition (Please see the Material and Equipment Table). For other hPSC lines or hPSCs maintained in different culture conditions, further optimization is recommended. Adapt the hPSC culture on iMEF feeders to the feeder-free condition. In cases where frozen cells do not survive well when directly recovered in the feeder-free condition, recover cells in iMEF condition first and then adapt to the feeder-free condition. NOTE: In general, it takes 2 passages for hPSCs cultured on iMEF feeders to be adapted to the feeder-free condition. Change the medium every day and passage the hPSCs when the cells have reached ~80% confluency. In general, passage hPSCs at ~ 1:6 - 1:15 ratios every 4 - 6 days. Add 10 µM ROCK inhibitor Y-27632 when thawing or passaging the cells. Prior to seeding the hPSCs, pre-coat culture dishes with 5 µg/mL (1 mL/10 cm2) truncated recombinant human form of vitronectin (VTN) for at least 1 h at room temperature (RT). Also, prepare complete chemically defined medium by adding supplement into the basal medium. Remove the culture medium, wash the cells once with PBS without Ca2+ and Mg2+, and treat the cells with 0.5 mM EDTA for ~ 2 - 5 min at RT. Aspirate the EDTA before the colonies have detached. With gentle pipetting, disperse the hPSC colonies into small pieces and resuspend the cells in complete medium. Collect the dissociated hPSCs and spin down the cells at 200 x g for 5 min. Resuspend the pelleted hPSCs in the complete medium and seed the cells on VTN-coated plates. Order and amplify the following plasmids: AAVS1-TALEN-L, AAVS1-TALEN-R, AAVS1-Neo-M2rtTA, and AAVS1-Puro-iCas9. NOTE: To avoid unexpected recombination events, use recombination-deficient Stbl3 competent cells for the transformation and amplification of plasmids at 30 °C. Typically, prepare the hPSCs in one 10-cm dish (~ 1 x 107 cells if ~ 80% confluent) for one targeting experiment. NOTE: Since electroporation usually causes significant cell death and TALEN-mediated gene targeting in the AAVS1 locus requires antibiotic selection, a relatively large number of cells need to be seeded to identify correctly targeted cells. Optimization for the drug concentrations is recommended for each cell line and each culture condition. On Day -1, (the day before electroporation), add 10 µM ROCK inhibitor during the media change. On Day 0, (the day of electroporation), prepare VTN-coated plates in advance. Dissociate the hPSCs into single cells using 1x dissociation reagent (please see the Material and Equipment Table). Briefly, remove the culture medium, wash the cells once with PBS without Ca2+ and Mg2+, and treat the cells with 1x dissociation reagent at 37 °C for ~ 3 min. Aspirate the dissociation reagent before the cells have detached. With gentle pipetting, disperse the hPSCs into a single-cell suspension in 10.5 mL of complete medium. Take 0.5-mL cell suspension to count the cell number using an automated cell counter. Pellet the hPSCs at 200 x g for 5 min and resuspend the cells in cold (4 °C) PBS at 12.5 x 106 cells/mL. Add the plasmids (see Table 1) into 800-µL hPSC suspension (12.5 x 106 cells/mL) and mix well. Transfer the mixture to a 0.4-cm electroporation cuvette and keep on ice for ~ 5 min. Electroporate the cells using an electroporation system at 250 V and 500 µF; the time constant observed after electroporation is typically 9 - 13 ms.
After electroporation, transfer the cells to a 15-mL conical tube with 5 mL of pre-warmed complete medium. Critical for successful targeting: Use healthy proliferating hPSCs and handle the cells very gently when transferring, resuspending, and plating the cells after electroporation. Pellet the cells at 200 x g for 5 min. Resuspend the cells in 10 mL of complete medium with 10 µM ROCK inhibitor and plate 1, 2.5, and 5 x 106 cells onto each of the three VTN-coated, 10-cm dishes; this ensures that at least one of the plates will have sufficient colonies at single-cell clonal density for colony picking. On Day 1 (the day after electroporation), change the medium. On Days 2 - 5, start neomycin selection when the cells are ~ 60% confluent. Change the medium daily with 500 µg/mL G418 sulfate; significant cell death due to selection is typically observed 2 days after G418 selection. On Day 6, change the medium without antibiotic selection. On Days 7-9, start puromycin selection. Change the medium daily with 1 µg/mL puromycin dihydrochloride; significant cell death should be observed the next day. On Day 10, start changing the medium daily without antibiotic selection until the hPSC single-cell colonies reach 1 - 2 mm in diameter. NOTE: Typically, 50 colonies in a 10-cm dish are observed with 2.5 x 106 hPSCs plated on Day 0. Pick 12 - 24 colonies under a stereomicroscope. Mechanically disaggregate the hPSC colonies into small pieces (~ 10 pieces per colony) using a 23-G needle (a 200-µL pipet tip is also fine) and transfer the cells directly into VTN-coated 24-well plates. Change the medium daily until the cells become confluent. Passage the cells in each well of the 24-well plates into duplicate wells of 6-well plates. When the cells become confluent in the 6-well plates, use one well for a frozen stock and the other well for genomic DNA extraction for further characterization. Characterize and validate the established iCas9 lines by PCR genotyping, Southern blotting, RT-qPCR analysis, karyotyping, and pluripotency assay. Refer to Zhu et al.21 for detailed experimental procedures. Choose target regions in the gene of interest to maximize the possibility of disrupting wild-type protein function. For well-annotated genes, choose a target region upstream of an essential functional domain. Alternatively, design gRNAs to target a region downstream of the start codon. Choose at least 2 different regions for a gene of interest. Design gRNAs using the online CRISPR design tool (http://crispr.mit.edu). For each target region, design 3 gRNAs with low potential off-targets and use the one with the highest targeting efficiency for generating clonal mutant line22. NOTE: In order to achieve high genome editing efficiency, it is recommended to deliver gRNA as RNA oligos instead of as plasmid DNA because of the higher transfection efficiency of small RNAs compared to plasmids in past experience. Order 120 nucleotide (nt) DNA oligos containing the T7 promoter sequence, the variable 20-nt crRNA recognition sequence (N)20 (do not include the PAM sequence), and the constant chimeric guide sequence. Dilute the oligos to 100-µM stock solution in ddH2O and prepare 250-nM as working solution. PCR-amplify the oligos using the T7F and TracrR primers (see Table 2) to produce the double-stranded DNA (dsDNA) template for gRNA in vitro transcription (IVT). Use 50 µL of PCR reaction mixture (see Table 3) and PCR cycle conditions (see Table 4). Use a high-yield T7 transcription kit for in vitro gRNA transcription with the PCR-amplified template in 20 µL, in vitro gRNA transcription mix (see Table 5) as per the manufacturer's instructions. Purify the gRNA products using the transcription clean-up kit as per the manufacturer's instructions. Elute gRNAs following the high-throughput purification protocol as per manufacturer's instructions (typically ~ 50 - 100 µg) in 100 µL of elution buffer. Adjust the concentration to 320 ng/µL (10 µM) when possible and store at -80 °C until use. Design and validate PCR primers amplifying the target region, with product sizes typically ranging from ~ 500 - 1,000 bp. Design Sanger sequencing primers binding internally to the PCR products to allow direct sequencing of the PCR products without purification. On Day -1, treat iCas9 cells with 2 µg/mL doxycycline 24 h before gRNA transfection. On Day 0 of gRNA transfection, prepare VTN-coated plates in advance. Dissociate iCas9 cells into single cells using 1x dissociation reagent, as described in step 2.5. Pellet the hPSCs at 200 x g for 5 min and resuspend the cells at ~ 0.5 x 106 cells/mL in complete medium supplemented with 2 µg/mL doxycycline and 10 µM ROCK inhibitor. Plate 0.5 mL of the resuspended cells into individual wells of 24-well plates. Prepare additional wells to serve as non-transfected controls. For each gRNA, make the following transfection mixtures: Mix A, 50 µL of reduced serum medium + 1 µL of gRNA (10 µM); Mix B, 50 µL of reduced serum medium + 3 µL of transfection reagent. Combine Mix A and B to make 100 µL mixture. Incubate for 5 min at RT. Add 50 µL of the mixture to cells in the duplicate wells of the 24-well plates and mix well. On Day 1, perform a second transfection if needed to further increase the targeting efficiency. Otherwise, change the medium without doxycycline. On Days 2 - 3, change the medium daily. On Day 4, extract genomic DNA from one well of each transfected and non-transfected control cell using a DNA extraction kit. Adjust the concentration to 50 ng/µL. PCR-amplify the target regions flanking the gRNA targeting sequences and estimate the editing efficiency using T7 endonuclease I (T7EI) digestion or the restriction fragment length polymorphism (RFLP) assay, as described previously5. PCR-amplify the target region using the primers designed and validated in step 3.1. Prepare the mixtures (see Table 6) and perform DNA denaturation and hybridization of the PCR products using conditions outlined in Table 7. NOTE: Based on our experience, it is generally not necessary to purify PCR products for the T7EI assay when using our PCR condition. However, purification could be beneficial in other conditions. Perform a T7EI digestion at 37 °C for 30 min using 10 µL of denatured and hybridized PCR product and 0.2 µL (2 U) of T7E1 (10 U/µL). Resolve the T7E1-digested PCR samples by gel electrophoresis. Use ImageJ to determine the relative band intensities of cut and uncut DNA. Calculate the indel frequency using the formula: (1 - (√(1-(b+c))/(a+b+c))) x 100, where a is the intensity of the undigested PCR product and b and c are the intensities of the T7E1-cleaved products. NOTE: In cases where a restriction site is in close proximity (< 5 bp) to a Cas9 cleavage site (3 bp 5' of the PAM sequence), an RFLP assay can be performed to quantify the indel frequency. Use the same PCR products as described in step 3.1.4.1. Digest the PCR product with a restriction enzyme that contains a restriction site in close proximity to the Cas9 cleavage site. Resolve the digested PCR samples by gel electrophoresis. Use ImageJ to determine the relative band intensities of cut and uncut DNA. Calculate the indel frequency using the formula: a / (a+b+c) x 100, where a is the intensity of the undigested PCR product and b and c are the intensities of the digested products. NOTE: Genome editing in hPSCs using the iCRISPR system with gRNA transfection is highly efficient, and no antibiotic selection is needed. To establish clonal lines, it is necessary to seed cells at a relatively low density to ensure the formation of single-cell-derived colonies. Identify gRNAs with the highest editing efficiency (using the T7EI or RFLP assay) and with good cell survival. Use the corresponding duplicate well for clonal mutant line establishment. Dissociate the hPSCs into a single-cell suspension using 1x dissociation reagent, as described in step 2.5. Replate 500, 1,000, and 2,000 cells onto each of the three VTN-coated, 10-cm dishes. Change the medium daily until the single-cell colonies reach ~ 2 mm in diameter. Pick 24 - 48 colonies for each gRNA, depending on the estimation of targeting efficiency by the T7EI and/or RFLP assay. Mechanically disaggregate each colony into small pieces (~ 10 pieces per colony) using a 23-G needle (a 200-µL pipet tip is also fine) and replate the cells in duplicate VTN-coated, 96-well plates. Use one plate for genomic DNA extraction and Sanger sequencing and the other plate for further expansion. When the cells in the 96-well plates have become confluent, extract the genomic DNA (without phenol/chloroform extraction) using a simple protocol, as outlined below. Remove the medium and wash the cells once with PBS without Ca2+ and Mg2+. Add 50 µL of lysis buffer (5 µL of Proteinase K (10 mg/mL), 5 µL of PCR buffer 10x, and 40 µL of ddH2O) to each well of a 96-well plate. 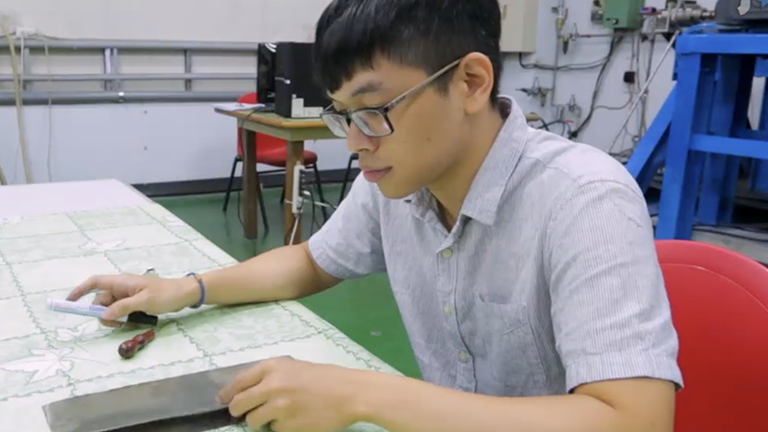 Seal the plate using an adhesive film and incubate overnight at 55 °C. The next day, transfer the cell lysates into a 96-well PCR plate and incubate for 10 min at 99 °C in a thermocycler to inactivate the Proteinase K.
PCR-amplify the target region using the same primers as for the T7EI or RFLP assay, using 1 µL of cell lysate as a template. Use 1 µL of the PCR product for Sanger sequencing with a primer binding internally to the PCR product. Amplify the clones with frameshift indel mutations for frozen stocks. Also, amplify a couple of wild-type clones from the same targeting experiment to serve as isogenic control lines for further experiments. NOTE: Compared with knockout mutants generated by non-homologous end joining (NHEJ), precise nucleotide alteration can be achieved through homology-directed repair (HDR) in the presence of DNA repair templates. Such precise nucleotide alterations allow for the generation of patient-specific mutations in wild-type hPSCs and for the correction of mutations in patient-derived iPSCs. Design and produce 2 - 3 gRNAs in close proximity to a patient-specific mutation, as described in step 3.1.1. Design a single-stranded DNA (ssDNA) containing the patient-specific mutation flanked by ~ 40 - 80 nt of homology on each side as an HDR template. To reduce additional cutting after the correct repair, introduce a silent mutation to the ssDNA template in the region within the gRNA recognition sequence and in close proximity to the PAM sequence or in the PAM sequence itself, if possible. If possible, design the silent mutation to introduce a novel restriction digestion site as well so that it can be used to estimate the repair efficiency using the RFLP assay. Perform the co-transfection of gRNA/ssDNA into iCas9 cells, as described in step 3.1.3, with transfection mixtures A and B. For each gRNA and non-transfected control, transfect the cells in duplicate wells of 24-well plates. Mix A: 50 µL of reduced serum medium + 1 µL of gRNA (10 µM) + 2 µL of ssDNA (10 µM). Mix B: 50 µL of reduced serum medium + 3 µL of transfection reagent. After transfection, extract genomic DNA from one well of each transfected and non-transfected control cell and estimate the repair efficiency using the T7EI and/or RFLP assay. Identify the gRNA/ssDNA mixture with the highest repair efficiency and good cell survival. Use the corresponding duplicate well for clonal mutant line establishment. Pick 48 - 96 colonies, depending on the estimation of the targeting efficiency by the T7EI and/or RFLP assay. In general, the efficiency of HDR-mediated mutation is lower than knockout mutation and thus more colonies need to be picked. Sequence, expand, and validate clonal lines, as described in step 3.1.6. NOTE: In vitro differentiation of hPSC mutants into disease-relevant cell types provides a platform for disease modeling in a dish. The following protocol focuses on the in vitro differentiation of hPSCs into glucose-responsive pancreatic β cells for pancreatic developmental and diabetic studies9,16,17. Maintain hPSC mutants and wild-type control lines in the chemically defined and feeder-free condition, as described in step 1. To prepare the hPSCs for differentiation, dissociate the hPSCs using 1x dissociation reagent and disperse them into single-cell suspension in complete medium. Pellet the cells at 200 x g for 5 min and re-suspend the cells in complete medium with 10 µM ROCK inhibitor. Count the cell number and seed the cells at ~ 1.4 x 105 cells/cm2 on VTN-coated plates. Change the medium 24 h after seeding. On Day 0, start the differentiation after 48 h, when the cells have reached ~ 80% confluency. NOTE: To achieve high pancreatic differentiation efficiency, optimizing the seeding density and level of confluency at 48 h is recommended for each individual line. Aspirate the hPSC medium and rinse the cells once with PBS without Ca2+ and Mg2+. Change the medium to differentiation day 0 (d0) medium. On Days 1 - 2, change the differentiation medium daily, according to the recipes in Table 8. On Day 3, examine the definitive endoderm markers SOX17, FOXA2, and CXCR4 by immunofluorescent staining and flow cytometry analysis. On Days 3 - 9, continue definitive endoderm differentiation toward the pancreatic lineage by changing the medium daily, according to the recipes in Table 9. On Day 7, examine the early pancreatic progenitor (PP1) marker PDX1 by immunofluorescent staining and flow cytometry analysis. On Day 10, examine the later pancreatic progenitor (PP2) markers PDX1 and NKX6.1. Meanwhile, prepare to transfer PP2 cells to air-liquid interface for further differentiation into pancreatic endocrine cells. Treat the PP2 cells with 10 µM ROCK inhibitor 4 h before dissociation. Remove the medium and rinse the cells once with PBS without Ca2+ and Mg2+. Add 2 mL of 1x dissociation reagent to PP2 cells in one 10-cm dish and incubate at 37 °C for 2 - 3 min. Aspirate the dissociation reagent before the cells have detached. Add 10 mL of BLAR medium and disperse the PP2 cells into single cells by gently pipetting up and down. Collect the single-cell suspension. Count the cell number and pellet at 200 x g for 5 min. Resuspend the cell pellet at ~ 0.5 x 105 cells/µL in S5 differentiation medium and spot 5 - 10 µL of cells per spot on a transwell insert filter. Place 10 - 15 spots in one 6-well insert and ~ 100 spots in a 10-cm insert. Add S5 medium to the bottom of each transwell insert, ~ 1.5 mL for 6-well inserts and ~ 8 mL for 10-cm inserts. Change the medium daily with the recipes in Table 10. Examine pancreatic endocrine markers PDX1, NKX6.1 NEUROD1, NKX2.2, INSULIN, and GLUCAGON on day 34 by immunofluorescent staining and flow cytometry analysis17. Examine hPSC-derived β-like cell function with a glucose-stimulated insulin secretion (GSIS) assay16,17. 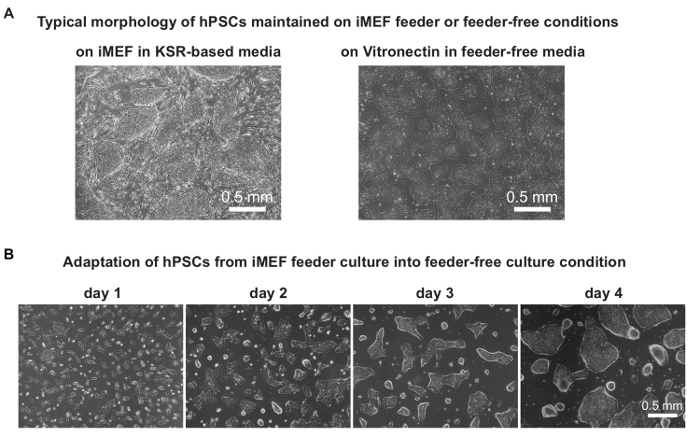 hPSCs cultured on iMEF feeders can be rapidly adapted to VTN-coated plates in the feeder-free culture condition. The same splitting ratio as normal iMEF feeder culture can be used during adaptation. Figure 1A shows typical morphologies of hPSCs on iMEF feeders in KSR-based medium and on a VTN-coated surface in feeder-free medium. Figure 1B shows a typical morphological change and the growth of hPSC colonies during the first passage of adaptation (4 days). The cells can be further passaged or frozen for future experiments. Carry out 2 - 3 passages of adaptation culture before starting differentiation experiments. Karyotyping is also recommended after adaptation, although we have not observed karyotype abnormalities during the adaptation phase. As shown previously, hPSCs were electroporated with a pair of AAVS1 TALEN plasmids and Cas9 and M2rtTA plasmids5. Figure 2A and B shows detailed donor vector targeting design and the whole procedure to generate iCas9 hPSC clonal lines. After antibiotic selection, single-cell-derived clones displaying adequate size and typical hPSC morphology were ready to be picked (10 - 12 days after electroporation, Figure 2C). Usually ~ 50% of the clones are correctly targeted without random integrations, as verified by Southern blotting (Figure 2D)5. Random integration could cause leaky expression of Cas9 in the absence of doxycycline treatment. In established iCas9 hPSCs, Cas9 is expressed with doxycycline treatment and guided to its target locus by the transfected gRNAs, where it generates DSBs. In the absence of a repair template, DNA repair through NHEJ generates indels, which often result in gene disruption or knockout. In the presence of a repair template (e.g., an ssDNA donor), HDR can be employed for precise genetic alterations, such as generating a patient-specific mutation in a wild-type hPSC background or correcting a disease-associated genetic variant in patient-derived iPSCs (Figure 3A). It takes ~ 1 month to generate clonal mutant lines using the iCRISPR system. After iCas9 induction and gRNA transfection, T7EI and/or RFLP assays were used to assess Cas9 cutting efficiency, and the transfected cells were later seeded as single cells into 10-cm dishes at low density (~ 500 - 2 ,000 cells/10-cm dish). 10 - 12 days later, single-cell-derived clones were placed in the wells of a 96-well plate for expansion and further characterization (i.e., genotyping and Western blotting) (Figure 3B). Since the iCRISPR-mediated gene knockout is highly efficient, no selection process is involved, and usually 20 - 50% biallelic mutants can be easily achieved (Figure 3C)5. For efficient and precise genetic alterations, gRNAs are co-transfected with an ssDNA donor carrying the specific sequence alteration (for a small but specific change of genome sequence). Often, to prevent re-cutting in modified alleles, it is recommended to include a silent mutation in close proximity to or in the PAM sequence (Figure 3D). With this system, ~ 10% of clones carrying the desired HDR-mediated genome modification without additional alterations in both alleles are achieved (Figures 3E). The rapid and precise modification of the hPSC genome using the iCRISPR platform allows us to quickly and efficiently make hPSC lines that serve as models for studying human development and disease. Recent progress in hPSC pancreatic differentiation has allowed the development of protocols that closely recapitulate pancreatic embryonic development. Undifferentiated hPSCs first differentiated into the definitive endoderm, then into PDX1+ early pancreatic progenitors (PP1) and PDX1+NKX6.1+ later pancreatic progenitor cells (PP2), and finally into glucose-responsive β-like cells16,17,19,20,23,24. These protocols were further optimized to reliably generate PDX1+NKX6.1+ pancreatic progenitors and glucose-responsive β-like cells9. Figure 4A shows the detailed chemical supplements used at each stage of differentiation. Usually, ~ 80% confluency 2 days after the initial cell plating is ideal for starting the differentiation of HUES8 hPSCs (Figure 4B). Testing several different seeding densities is highly recommended to discover the optimized condition for each specific cell line. Usually at least 75% FOXA2+SOX17+ cells at the DE stage and 40% PDX1+NKX6.1+ cells at the PP2 stage can be achieved (Figure 4C). At the S5 stage, the presence of an aura-like shape around the cell aggregate is an indicator for the good survival of the cells, which is important for further differentiation to NKX6.1+CPEP+ glucose-responsive β-like cells (Figure 4D). This protocol is useful for studying human pancreatic development and disease in a dish. Figure 1. hPSC Chemically Defined and Feeder-free Maintenance and Culture Adaptation from iMEF Feeders. (A) Representative images of hPSCs cultured on iMEF feeder or on VTN on day 4, ready to be split. (B) Typical morphology of hPSCs during the first passage of adaptation into feeder-free culture from an iMEF feeder. Day 4 hPSCs cultured on iMEF feeders were split and plated on VTN-coated plates in chemically defined medium with ROCK inhibitor. The splitting ratio was the same as the usual splitting ratio for culturing in iMEF feeder conditions. The medium was changed every day without ROCK inhibitor. Please click here to view a larger version of this figure. Figure 2. Generation of iCas9 hPSC Lines. (A) Targeting strategy for the generation of iCas9 hPSC lines. Puro-Cas9 donor and Neo-M2rtTA donor were targeted into the human AAVS1 locus by a pair of AAVS1 TALENs. (B) Schematics of the whole targeting process, including electroporation, antibiotic selection, colony picking and expansion, and cell line characterization. (C) Representative single-cell clone ready to be picked at around 10 - 12 days after electroporation. (D) Southern blot examples for identifying correctly targeted clones without the additional integration of two donor plasmids. Correct clones are marked in red. (A) and (D) were adapted from Reference 5, with permission. Please click here to view a larger version of this figure. Figure 3. Efficient Genetic Modification in hPSCs Using the iCRISPR System. (A) Schematics for the generation of gene knockout mutants or precise gene modification using the iCRISPR system. (B) Targeting procedure and clonal line establishment. (C) Gene knockout efficiency through NHEJ in hPSCs9. (D) Design of an ssDNA carrying a specific nucleotide modification. P, in red: patient-specific mutation; X, in green: silent mutation. (E) Efficiency of the HDR-mediated precise nucleotide modification. A precise R456C mutation (caused by a specific nucleotide C>T mutation) in the GATA6 locus was introduced using the iCRISPR system. (Refer to Reference 5 for more detailed information). (C) and (E) were adapted from Reference 9 and Reference 5, respectively, with permissions. Please click here to view a larger version of this figure. Figure 4. Directed hPSC Differentiation into Glucose-responsive Pancreatic β-like Cells. (A) Schematics of the detailed differentiation protocol, with chemicals supplemented at each stage of differentiation. Signaling pathways that are activated or inhibited during differentiation are highlighted in green or red, respectively. CHIR: GSK3 inhibitor; GDF8: growth differentiation factor 8 or myostatin, a TGF-beta protein family member; HH: Hedgehog; DE: Definitive endoderm; PP1: PDX1+ early pancreatic progenitor; PP2: PDX1+NKX6.1+ later pancreatic progenitor. (B) Typical confluency (70 - 80%) of hPSCs 48 h after seeding when ready for differentiation initiation. (C) Representative immunofluorescent staining images showing the successful differentiation at the definitive endoderm (DE) stage (FOXA2 and SOX17 co-staining), pancreatic progenitor stage (PP2: PDX1 and NKX6.1 co-staining), and glucose-responsive β-like cell stage (NKX6.1 and c-peptide co-staining). In general, to achieve more than 10% NKX6.1+CPEP+ cells at the β-like cell stage, at least 75% FOXA2+SOX17+ DE cells and 40% PDX1+NKX6.1+ PP2 cells are required at the corresponding stages. (D) Typical morphology of a cell aggregate at the S5 stage on an insert filter membrane in the air-liquid interface culture. The surviving cells have migrated to the center of the aggregate (in dark) and left an aura-like structure on the edge. (A) and (D) were adapted from Reference 9 with permissions. Please click here to view a larger version of this figure. Although recent approaches based on CRISPR/Cas systems for genome editing have led to successful targeting, a more efficacious and universal platform would be preferable for larger-scale analyses of gene function. The iCRISPR platform offers a rapid and efficient method to introduce mutations to any gene of interest5,9. First, the PCR-based gRNA synthesis method allows the production of hundreds of gRNAs in arrayed format in one day without the time-consuming cloning steps. Second, with doxycycline-inducible Cas9 expression in iCas9 hPSCs, the step involving gRNA transfection requires only a minimal amount of work, and thus, multiple gRNA targeting experiments can be conducted concurrently. Third, due to the high targeting efficiencies attainable with our system, the analysis of ~ 24 - 48 colonies per gRNA transfected should be sufficient to establish multiple monoallelic and biallelic mutant lines for a single gene, although efficiencies vary depending on the target locus. Since it is feasible for a trained individual to mechanically pick 384 colonies (4 x 96-well plates) in one sitting, which should take ~ 4 h under a dissecting microscope, a trained individual can be expected to generate mutant lines affecting 12 genes within 1 - 2 months. The streamlined generation of hPSC mutants in a short time allows for the systematic analysis of an array of transcription factors and/or signaling pathway components that interact with each other, regulating the developmental process9. Additionally, efficient multiplexed gene targeting also opens the door to investigating genetic interactions underlying complex human traits. The derivation of patient-specific iPSCs from easily accessible somatic cell types and the differentiation into disease-relevant cell types provide a great opportunity for the functional validation of disease-associated mutations. However, due to the considerable variability in genetic background between individuals, direct comparisons between iPSCs from patients and from healthy donors may not allow one to distinguish disease phenotypes from background effects. Therefore, it is necessary to generate isogenic control iPSCs by correcting the disease mutation back to the wild-type sequence or to introduce the patient-specific mutations into a wild-type hPSC background, as proposed by others25,26. In addition to loss-of-function (null) mutations, one may now more precisely dissect disease mechanisms through the introduction of a patient-specific sequence alterations into the endogenous locus in hPSCs, including hypermorphic, hypomorphic, neomorphic, or dominant-negative patient mutations. Precise genetic modification employs HDR for DSB repair in the presence of a repair template. Since it is much less efficient than NHEJ-mediated DNA repair, a donor plasmid containing the patient-specific mutation, a drug selection cassette, and homology arms has been previously used as the repair template2. After drug selection and verification of the patient-specific mutation, a second step is generally needed to remove the drug selection cassette. While the most widely used Cre-loxP and FLP-FRT systems leave behind residual sequence in the endogenous locus, the use of piggyBac transposon has allowed for the seamless removal of the drug selection cassette27. More recently, short ssDNA templates have also been shown to support efficient HDR with engineered DNA endonucleases28. Compared to a donor plasmid, ssDNA can be directly synthesized and thus circumvents the time-consuming cloning step. Here, it has been shown that, by co-transfecting gRNA and an ssDNA template to induce homology-directed repair, iCRISPR can be used to introduce specific nucleotide modifications with high efficiency. This is critical for not only dissecting the role of essential nucleotides within protein functional domains, but also for modeling human disease mutations and potentially correcting these disease-associated mutations for therapeutic intervention. Due to the large number of susceptibility loci that are each associated with multiple sequence variants, modeling complex and multigenic diseases such as diabetes has been a challenge for geneticists. As the iCRISPR platform is permissive for the rapid generation of an allelic series or for multiplexable gene targeting, it can facilitate the investigation of multiple disease-associated loci, either individually or in combination with isogenic backgrounds. We have found a good correlation between the T7E1 and RFLP assay results and the number of mutant lines identified by sequencing. This emphasizes the importance of performing these assays in parallel with the establishment of clonal lines. While the targeting efficiencies attained may vary depending on the genomic loci, in most single-gene-targeting experiments, 20 - 60% of the clones were found with both alleles mutated (including in-frame and frameshift mutations)9. In cases where multiplexed gene targeting was performed, triple biallelic mutant clones with 5-10% efficiencies were obtained5. ssDNA-mediated HDR of several genes were also performed to obtain precise genetic alterations, with the efficiencies of obtaining homozygous knock-in clones ranging from 1 - 10%5. Working with CRISPR/Cas in hPSCs, any mutations in potential off-target sites that do not share the same gRNA target sequence are yet to be detected5,9,12. Whole-genome sequencing performed in a recent study has also failed to identify substantial off-target mutations in clonal hPSC lines generated using CRISPR/Cas29. Nevertheless, to minimize any potential effect of confounding phenotypes introduced by mutations at off-target effect sites, it is suggested to generate independent mutant lines using at least two independent gRNAs targeting different sequences within the same gene. Similar phenotypes observed in multiple lines generated using different gRNAs could principally rule out the possibility that the phenotype comes from an off-target effect. Traditional methods for hPSC culture involve their maintenance and expansion on feeder cells in media containing serum or serum replacement that includes animal products, such as bovine serum albumin. Feeder cells, serum, serum replacement, and albumin all contain complex, undefined components and show considerable batch variability. Adapting to the feeder-free and chemically defined condition significantly reduces the efforts for hPSC maintenance and, more importantly, increases the consistency of differentiation experiments. At present, there are very few studies that describe genome editing procedures on hPSCs cultured in fully defined culture conditions30. We have found higher CRISPR targeting efficiencies when gRNA transfection and clonal deposition were performed in feeder-free conditions compared to feeder-dependent culture conditions. We believe that this is due to increased cell survival after transfection and single-cell seeding for colony formation. Moreover, feeder cells have previously been shown to sequester transfection reagents, thereby lowering the transfection efficiency. Previous differentiation protocols have yielded only a small fraction of insulin-positive cells, the majority of which were polyhormonal and resembled fetal endocrine cells23. 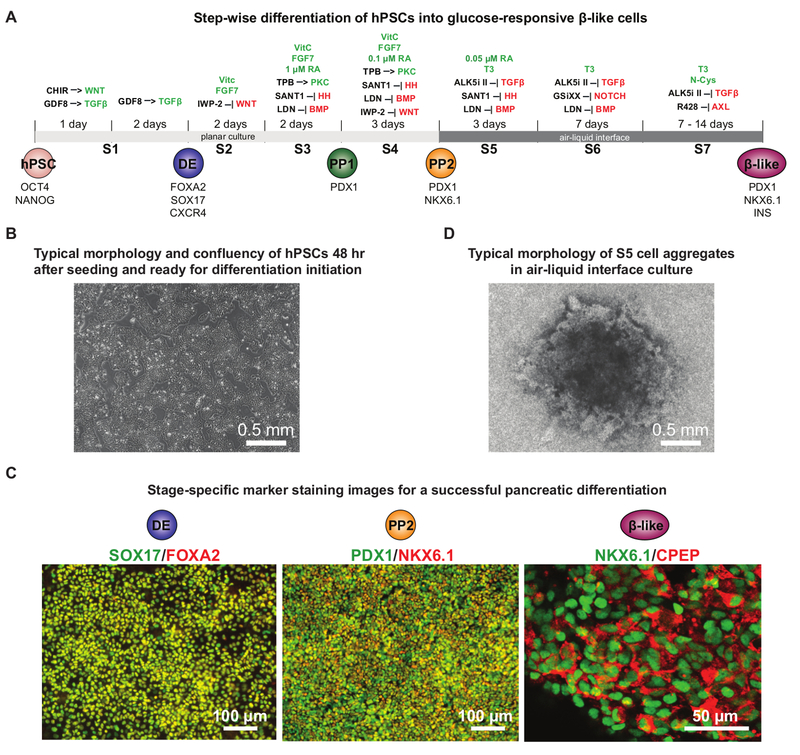 Recent progress has permitted the differentiation of hPSCs into more mature glucose-responsive beta-like cells16,17,19,20. We can routinely obtain at least 75% definitive endoderm cells, 40% PDX1+NKX6.1+ pancreatic progenitors, and around 20% NKX6.1+CPEP+ glucose-responsive beta-like cells using HUES8 hPSCs9. When combined with the iCRISPR genome editing system, this more robust differentiation protocol has facilitated the analysis of transcription factors that are crucial to the pancreatic progenitor and endocrine stages of pancreatic differentiation. This will make it possible, in future studies, to examine a large number of candidate disease genes for the functional validation and investigation into the mechanisms that underlie diabetes9. Our iCRISPR system may facilitate the generation of more complex genomic modifications, such as the creation of reporter alleles through HDR-mediated gene targeting using long donor DNA templates encoding protein tags or fluorescent reporters12. We have shown that, due to the high CRISPR targeting efficiencies attained in the system, this process can be performed in hPSCs, without the need for further drug selection12. Furthermore, multiplexed gene targeting can be used to investigate genetic interactions underlying complex human disease, as shown in our recent study, which we believe is the first example of such work31. iCRISPR can also be used to understand gene regulatory control by creating deletions either in noncoding RNAs or in gene regulatory regions, such as promoters and enhancers. To efficiently generate regulatory mutants using iCRISPR, gRNAs can be designed to disrupt the binding site of a DNA-binding protein, including but not restricted to the basal transcriptional machinery or a tissue-specific transcription factor. ssDNA template-mediated HDR can also be used to mutate specific protein-binding sites. Finally, we envisage that further optimization would enable the use of the iCRISPR platform in hPSCs for higher throughput genetic analyses of pluripotency phenotypes or disease phenotypes when combined with an in vitro differentiation protocol. These iCRISPR-mediated studies may allow for the more rapid identification of candidate disease-associated genes and studies of their functional relevance. This work was funded in part by NIH/NIDDK (R01DK096239) and New York State Stem Cell Science (NYSTEM C029156). Z.Z. was supported by the NYSTEM postdoctoral fellowship from the Center for Stem Cell Biology of the Sloan Kettering Institute. Capecchi, M. R. Gene targeting in mice: functional analysis of the mammalian genome for the twenty-first century. Nat Rev Genet. 6, (6), 507-512 (2005). Zwaka, T. P., Thomson, J. A. Homologous recombination in human embryonic stem cells. Nat Biotechnol. 21, (3), 319-321 (2003). Eiges, R., et al. Establishment of human embryonic stem cell-transfected clones carrying a marker for undifferentiated cells. Curr Biol. 11, (7), 514-518 (2001). Kim, H., Kim, J. S. A guide to genome engineering with programmable nucleases. Nat Rev Genet. 15, (5), 321-334 (2014). González, F., et al. 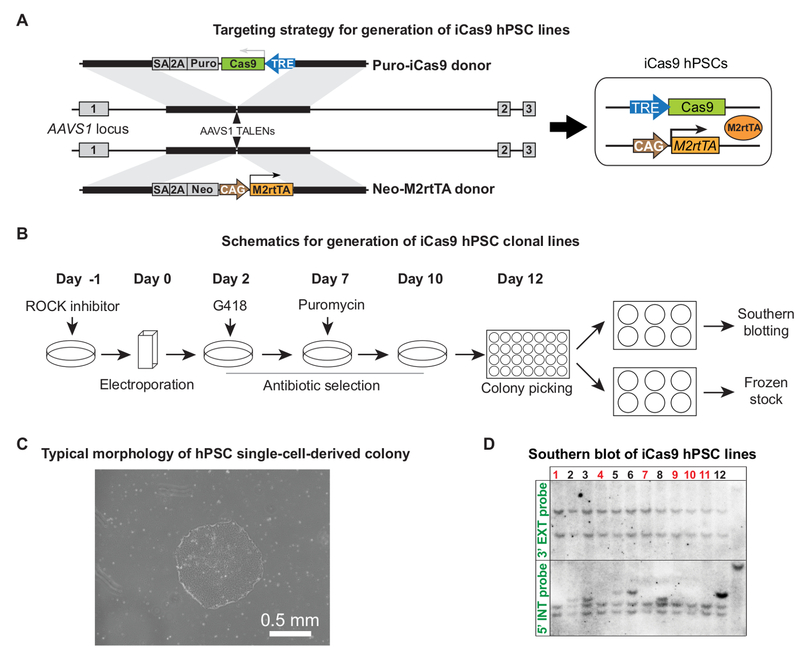 An iCRISPR Platform for Rapid, Multiplexable, and Inducible Genome Editing in Human Pluripotent Stem Cells. Cell Stem Cell. 15, (2), 215-226 (2014). Braam, S. R., et al. Improved genetic manipulation of human embryonic stem cells. Nat Methods. 5, (5), 389-392 (2008). Zhu, Z., et al. Genome Editing of Lineage Determinants in Human Pluripotent Stem Cells Reveals Mechanisms of Pancreatic Development and Diabetes. Cell Stem Cell. 18, (6), 755-768 (2016). Kotini, A. G., et al. Functional analysis of a chromosomal deletion associated with myelodysplastic syndromes using isogenic human induced pluripotent stem cells. Nat Biotechnol. 33, (6), 646-655 (2015). Carlson-Stevermer, J., et al. High-Content Analysis of CRISPR-Cas9 Gene-Edited Human Embryonic Stem Cells. Stem Cell Reports. 6, (1), 109-120 (2016). Zhu, Z., Verma, N., Gonzalez, F., Shi, Z. D., Huangfu, D. A CRISPR/Cas-Mediated Selection-free Knockin Strategy in Human Embryonic Stem Cells. Stem Cell Reports. 4, (6), 1103-1111 (2015). Mandegar, M. A., et al. CRISPR Interference Efficiently Induces Specific and Reversible Gene Silencing in Human iPSCs. Cell Stem Cell. 18, (4), 541-553 (2016). Chen, G., et al. Chemically defined conditions for human iPSC derivation and culture. Nat Methods. 8, (5), 424-429 (2011). Rezania, A., et al. Production of functional glucagon-secreting alpha-cells from human embryonic stem cells. Diabetes. 60, (1), 239-247 (2011). Pagliuca, F. W., et al. Generation of functional human pancreatic beta cells in vitro. Cell. 159, (2), 428-439 (2014). Rezania, A., et al. Reversal of diabetes with insulin-producing cells derived in vitro from human pluripotent stem cells. Nat Biotechnol. 32, (11), 1121-1133 (2014). Chen, S., et al. A small molecule that directs differentiation of human ESCs into the pancreatic lineage. Nat Chem Biol. 5, (4), 258-265 (2009). Nostro, M. C., et al. Efficient generation of NKX6-1+ pancreatic progenitors from multiple human pluripotent stem cell lines. Stem Cell Reports. 4, (4), 591-604 (2015). Russ, H. A., et al. Controlled induction of human pancreatic progenitors produces functional beta-like cells in vitro. EMBO J. 34, (13), 1759-1772 (2015). Zhu, Z., Gonzalez, F., Huangfu, D. The iCRISPR platform for rapid genome editing in human pluripotent stem cells. Methods Enzymol. 546, 215-250 (2014). Soh, C. L., Huangfu, D. CRISPR/Cas9-Mediated Mutagenesis of Human Pluripotent Stem Cells in Defined Xeno-Free E8 Medium. Methods in Molecular Biology. 1498, (2017). Kelly, O. G., et al. Cell-surface markers for the isolation of pancreatic cell types derived from human embryonic stem cells. Nat Biotechnol. 29, (8), 750-756 (2011). Musunuru, K. Genome editing of human pluripotent stem cells to generate human cellular disease models. Dis Model Mech. 6, (4), 896-904 (2013). 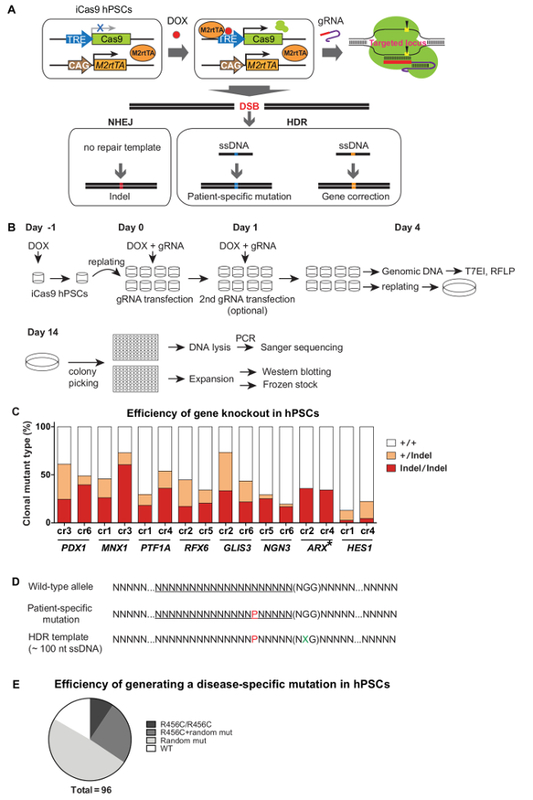 Hockemeyer, D., Jaenisch, R. Induced Pluripotent Stem Cells Meet Genome Editing. Cell Stem Cell. 18, (5), 573-586 (2016). Yusa, K., et al. Targeted gene correction of alpha1-antitrypsin deficiency in induced pluripotent stem cells. Nature. 478, (7369), 391-394 (2011). Chen, F., et al. High-frequency genome editing using ssDNA oligonucleotides with zinc-finger nucleases. Nat Methods. 8, (9), 753-755 (2011). Veres, A., et al. Low incidence of off-target mutations in individual CRISPR-Cas9 and TALEN targeted human stem cell clones detected by whole-genome sequencing. Cell Stem Cell. 15, (1), 27-30 (2014). Huang, X., et al. Production of Gene-Corrected Adult Beta Globin Protein in Human Erythrocytes Differentiated from Patient iPSCs After Genome Editing of the Sickle Point Mutation. Stem Cells. 33, (5), 1470-1479 (2015). Shi, Z. D., et al. Genome Editing in hPSCs Reveals GATA6 Haploinsufficiency and a Genetic Interaction with GATA4 in Human Pancreatic Development. Cell Stem Cell. in press (2017).